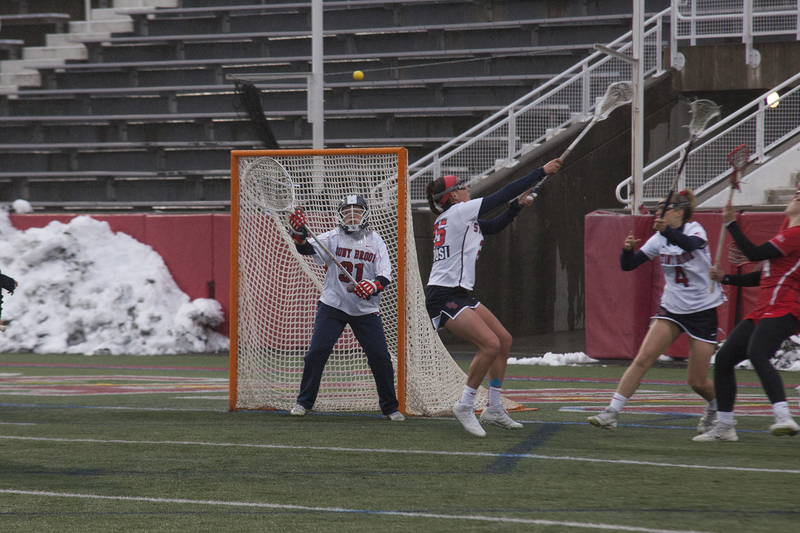 Stony Brook Women’s Lacrosse suffered its first defeat in a regular season matchup since March 11, 2017, falling 11-7 to the No.13-ranked University of Denver Pioneers on Sunday, Feb. 24. The loss snapped the Seawolves’ 29 regular season win streak that dated back to March 2017. It marks the first time the team was held to single digits in a loss since the 7-6 heartbreaker to Northwestern on March 12, 2016. It also marks the first time they have faced an upset since the 14-10 loss to No.12-ranked USC the following game in 2016 when they were ranked 11th in the nation. Denver started off the contest hot with a five-point run in the first 15 minutes of the game. Five different Pioneers scored during the run, which was capped off by sophomore attacker Bea Behrins. Sophomore midfielder Rayna Sabella broke the scoreless drought for Stony Brook, as it later responded with a three-point run midway through the first half and cut the score to 5-3 with 10 minutes remaining. Denver, however, had a response for every Stony Brook offensive push. The Pioneers scored two more goals, both by senior midfielder Elizabeth Behrns, which gave her the hat trick on the day and extended her team’s lead to 7-3. The Seawolves were outshot 14-13 with 13 Pioneers’ shots landing on net at the end of the first half. Stony Brook senior goalkeeper Anna Tesoriero finished the first 30 minutes with six saves but surrendered seven goals, the most she has allowed in the first half since the loss to Florida in 2017. The Seawolves did their best offensively to match the deficit opening the second half. Junior attacker Taryn Ohlmiller maximized the scoring opportunity off the assist from sophomore midfielder Siobhan Rafferty, sparking a three-goal run with 22 minutes remaining. The drive was capped off by Sabella finding the back of the net, closing the gap to 8-6. However, Denver shut down further comeback attempts with a strong defensive showing for the rest of the quarter. The Pioneers outscored the Seawolves three-to-one, with junior midfielder Molly Little’s last-minute goal icing the game. Head Coach Joe Spallina considers this matchup to be a positive experience for his squad. Senior midfielder Mackenzie Burns finished the game with two ground balls and a goal, which Spallina later praised in a postgame interview. The team’s opening matchup of the season had a positive result, running out the gate with a 15-5 victory at the University of Colorado on Friday, Feb. 22. Rafferty, Ohlmiller and junior midfielder Ally Kennedy all recorded hat tricks in the game. Ohlmiller also scored five assists in the game including two to Rafferty. Stony Brook scored eight goals in the first half and held Colorado to a single goal while outshooting the team 19-9, with 15 on goal. The team continued applying pressure to the Buffaloes in the second half of play, scoring the ninth goal just a minute into the half. The game’s final score came from the stick of senior midfielder Keri McCarthy with 1:14 left in the matchup, icing the team’s season-opener with a victory. Tesoriero saved a total of 14 shots and allowed five in the game. Spallina was proud of his team’s resilient effort in their first game of the year. Stony Brook travels to Maryland to take on Towson on Friday, March 1. The team looks to steer away from a sub .500 winning percentage since 2016 when it began the year at a record of 2-3.